Mr. Oswald of NASA reached out to All Noise Control for help in replacing deteriored foam panels in a test cell used at NASA. The test cells used at NASA are exposed to all types of equipment, engines and combustibles during testing. They required a quality foam panel with high fire ratings. All Noise Control knew that their Class 1 Fire Rated Melamine Foam Panels was ideal for such potentially volitale test environments in addition to being resistant to most organic solvents, alkalis, and diluted acids. The ANC Melamine Foam Panel, when exposed to high heats and open flame, will simply melt without creating smoke. This offers a much safer and controlled foam test cell. While NASA was happy with the performance of this product in this application, it’s often used commonly in schools and public buildings due to it’s Fire Class 1 Rating and safety properties. We invite you to call All Noise Control at 561-964-9360 to discuss the noise control materials supplied to this particular facility and are just as happy to listen to your individual needs and supply you with a customized All Noise Control Solution. 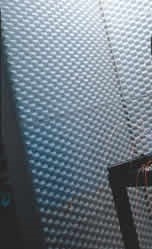 You may also visit our acoustic foams page for more information at www.allnoisecontrol.com. Panels are available in 1″, 2″, and 3″ thicknesses with a standard size of 24″ x 48″. Custom sizes are available per customer requirements.